Santa Monica is a very casual place. A cruiser will get you everywhere, apparently, even Tiffany's. Even the tourists join in with the minimal attire requirement. The shorter the skirt, the closer to God? As my skirt has no business being 20 year old short, I decided to bring a little SF to the PCH. bike date welcomes you to santa monica! SF is looking good next to all the mini-skirted youngsters! 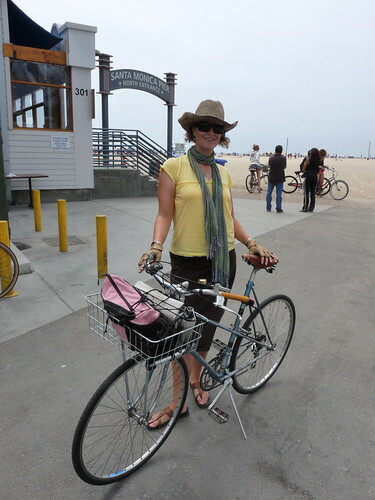 I think you have the same bike in that photo as I do -- Is that a Motobecane Mirage Mixte? Thank you, bikedate! I didn't realize you were there. Next time, we will have to beer/coffee/ride! absolutely. let me know next time - likewise if i ever get back home to SF for any length of time. bd- You are sooooooooo on! Well I have to agree with Billy Joel as well; but am also a follower of the Church of Short Skirts and Long Legs. BTW I had my first celebrity sighting of you last week! I saw you riding on Market street with a basket full of interesting clothes shopping followed by your husband I think. I was going to shout "hey Bozo" because I couldn't remember your real name and then I stopped as that wouldn't have sounded to nice. Hey, Adrienne! You're a celebrity!